Yep, it's true. Rockstar Games has just announced that they are releasing the expansion packs for PS3 and PC. We are happy to announce the much anticipated release of Grand Theft Auto: Episodes from Liberty City for the PlayStation�3 computer entertainment system and Games for Windows� - LIVE on March 30, 2010. For the first time, PlayStation 3 and Games for Windows - LIVE players will have the opportunity to experience the last two thrilling chapters of the Grand Theft Auto IV saga. The two action packed episodes will also be available for download on the PlayStation Network and Games for Windows� LIVE on March 30, 2010. Each episode boasts the same detailed and immersive Liberty City we all know and love. Games for Windows - LIVE players can enjoy 32-player multiplayer matches and an advanced video editor, and all fans will have the chance to once again listen to the dulcet tones of Liberty City Radio. Rockstar have released the second array of cheats for the Apple versions of Chinatown Wars, see the previous news post for details on how to enter these in game (using the mission replay board). Rockstar have released the first part in what they promise will be a series of cheat reveals for the iPhone / iPod touch version of Chinatown Wars. The cheats revealed today are all for weapons. Rockstar have released the official debut trailer for GTA Chinatown Wars on the iPhone / iPod touch. Check it out below. 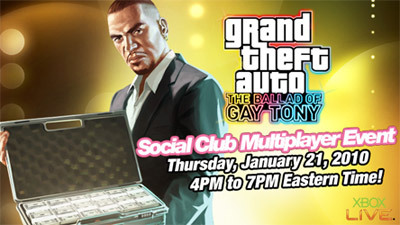 Rockstar will be hosting yet another Ballad of Gay Tony multiplayer session this Thursday, 21st January from 4:00 to 7:00 PM EST (9:00 - 12:00 GMT). Full details of the event can of course be found on the Rockstar Newswire posting, and once again the event will be streamed live on the Social Club so those of you who can't join in the fun will be able to watch it all unfold. A recap plus screenshots of the last event can be found here. GTA Chinatown Wars was originally announced for the iPhone and iPod Touch back in August 2009, and since then, there have been absolutely no reviews, screenshots, hype, or any sign of progress from Rockstar Games. Some thought it might have been cancelled, or at the very least delayed. While there is still no official announcement from Rockstar, it was released just over an hour ago at midnight tonight (GMT) and is now available to download from the iTunes Store, the 188MB download costing �5.99. Psy over at iGTA appears to be one of the first to get the game, and you can check out some random screenshots he's taken on iGrandTheftAuto. UPDATE: The game is now available in the US store priced at .99.